The 2008 Spirit of America (SOA) Match was a huge success. With International Team Competition on the menu this year, the SOA drew scores of top Palma shooters from around the world. Over 160 competitors came to the Whittington Range in Raton, New Mexico to compete for honors in both Full-bore Target Rifle and F-Class matches. Spc. Tyrel Cooper of the USAMU won the Target Rifle Overall Aggregate. Ty Cooper has “been on a roll lately, and has been shooting great”, according to Veteran Team member Jerry Tierney. On the F-Class side, Larry Bartholome shot consistently to top a very competitive field. Congrats to both Ty and Larry! Team competition was a major highlight of the SOA. In the America Match* for national teams, The U.S.A. Team finished first, beating Australia (second place) and England (third place). Individual USA Team member scores are posted below. We’re pleased to see forum member Bryan Litz shooting well, and we salute Sherri Hurd. Not only was Sherri the top female shooter in the America Match, but her 597-36X score was the third best in the entire field, after England’s David Luckman (599-35X) and Team USA teammate Tyrel Cooper (597-40x). The U.S.A. Veterans’ Team performed extremely well, actually posting the second highest team total overall. That’s right — the American veterans out-scored the National teams of Australia and the UK. “Not bad for a bunch of old guys, wouldn’t you say”, Tierney observed. For complete Match Results, visit the Bald Eagles Club website, BaldEaglesRC.org. For the English perspective on the match, visit the Team England Website. It offers match results, tech info about the sport, and a Photo Gallery with dozens of images. *The America Match is a major international Palma competition first hosted in 2002. Matches are held every two years. Each team is composed of eight shooters, two sub-coaches, a main coach, an adjutant, a captain and two reserves. It is a multi-distance event. Course of fire is: 2 sighters and 15 shots for record at 300, 600, 900 and 1000 yards (or 300, 600 yards and 800 and 900 meters as appropriate to the venue). Share the post "Ty Cooper and Larry Bartholome Top Field at Spirit of America"
For two years, Forum member John Skowron (John708) has been campaigning a 6BRX, built by Nat Lambeth (RustyStud). You’ll find the full history of John’s 6BRX project in this Forum Thread. With this rifle, John was the overall 1000-yard winner at Butner in February 2007. Case life running the Berger 105s at 3000+ fps is 14-15 reloads. Brass was discarded when the primer pockets became too loose. The 6BRX brass OAL after fireforming is 1.56″. Max OAL for the 6BRX is 1.58″. The brass never stretched enough to require trimming before discard. Another plus for the 6BRX and Lapua brass. By the way don’t even bother with Remington-brand 6BR brass. The primer pockets were so loose after my standard fire-forming load I had to trash all the cases. Stick with the good stuff, Lapua. 2750 Rounds: I now have 2570 rounds through my 6mm BRX. I was just at the range today doing an accuracy test. I shot two 10-shot groups at 100 yards, one with 105gr Bergers, and the other with 107gr Sierras. Both were identical 0.44″ 10-shot groups. Not bad for a rifle with 2500+ rounds through it. 2900 Rounds: I now have 2900 rounds through my 6mm BRX. I was doing some load testing with the new 6mm Berger bullets. I compared them with my existing comp. load in my 6mm BRX. The 105gr Bergers, jammed .015″ into the lands, with 31.5 grains of Varget and Fed 205s are still shooting .45″ 10-shot groups at 100 yards. Velocity is 3060 fps. I don’t know how long this Broughton barrel will last, but I’m amazed that it’s lasted this long. 2950-3044 Rounds: I had virtually no throat erosion until I reached 2900 rounds. After 2900 rounds throat became noticeably rougher on cleaning and groups opened up. 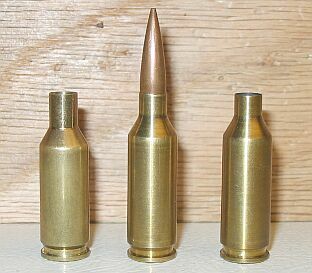 10-shot groups with match ammo were now .53″ (compared to low fours before). At 2950 rounds the groups ran .58″. At 3044 rounds, the groups opened up to .7″. That’s not enough accuracy for LR work. CONCLUSION: Barrel life with competitive accuracy was 2900 rounds with this gun. Share the post "6BRX: Long-Term Accuracy and Barrel Life Report"